Black n Sassy Wake up Right WRAP Straight the Motion of Lotion the Power of Cream 13 oz Fast drying and never drip The motion of lotion the power of cream Special thick grease free cream formula dries without dripping with a soft natural hold Cream is truly a high performance product that will hold the hair in place-without crunchiness or flaking. 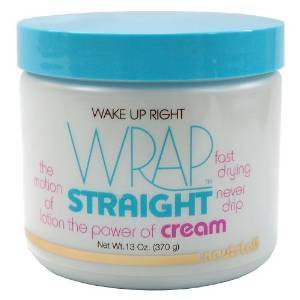 Wrap Cream adds style support and still allows swing, bounce and movement. Wrap Cream deeply penetrates for maximum conditioning, adding a silky smooth straight look and unbeatable shine. Great for wraps, blow drying, sculpting, and all types of sets.